KARMA & SANCTUM = ROCKING RESORTS AROUND THE WORLD! We are excited to announce a brand new collaboration with the Sanctum Hotel Group to develop a collection of rock-themed hotels around the world! These new properties will be strategically located in the coolest destinations – places like New York, London, Paris & Tokyo. As well as stylish bars, spas and clubs they will include facilities like recording studios and cinema screening rooms. The idea is that these are not just hotels for fans of rock, but for touring bands and musicians too. 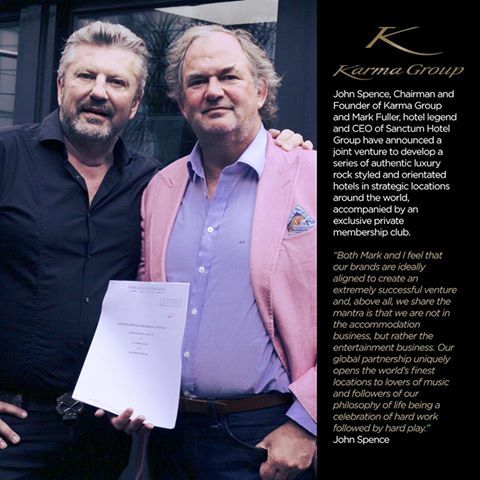 Karma Chairman John Spence is no stranger to the music industry, having managed some high profile UK pop outfits in a previous incarnation. Alongside Sanctum CEO Mark Fuller, he’ll be building an exciting new brand coupled with an über-exclusive membership club….Watch this space and get ready to rock out!